The years between the 1920s and the 1960s saw a transformation of chemistry in several aspects. These included the development of biochemistry, polymer chemistry, quantum chemistry, and computational chemistry, as well as the instrumental revolution. New methods, theories, and technologies opened up new fields of chemical sciences, and the chemical industry grew to be one of the most important branches of industry that supported national economies. Chemistry was greatly influenced by World War II and the Cold War, when it was directed especially to military and security needs, while the public image of chemistry also changed, due largely to the environmental problems caused by synthetic chemical materials. These years also saw developments in Japanese chemistry. The first generation of Japanese chemists started their research in the early 20th century. Born and educated after the Meiji Restoration, the starting point of Japan’s full-fledged modernization, some of them founded a research strategy that aimed to study the structure of components of Japan’s local natural products using methods newly developed in Europe, in order to compete with chemists in the West. However, after several decades, the accomplishments of seven Japanese Nobel laureates in chemistry became not fundamentally different from those of their Western counterparts. Their researches, performed mostly from the 1950s to the 1970s, developed new methods and theories and opened new fields. Clearly, there must have been a transformation of chemistry research in Japan between the 1920s and the 1960s as well. 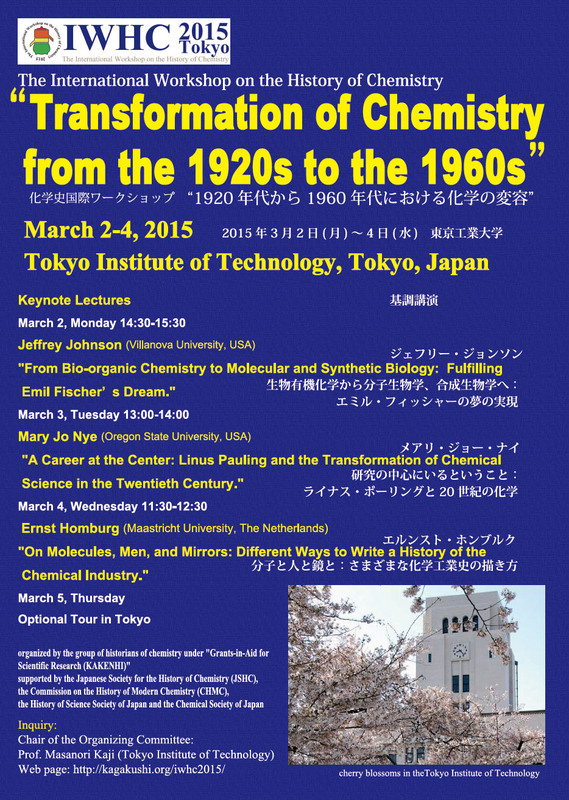 The aim of the workshop “Transformation of Chemistry from the 1920s to the 1960s” is to stimulate a discussion of the transformation of chemistry in Japan and/or in the world during the period with comparative perspectives. The workshop may take an interdisciplinary approach and pay special attention to the social dimension of chemistry. This subject has only recently started to be discussed and even then it has only been considered intermittently. This workshop attempts to bring those interested in the history of chemistry in the 20th century together for dialogue and debate from various perspectives. It will comprise thematic three keynote lectures and eight sessions with papers. Abstracts of less than 400 words should be submitted no later than May 30, 2014 by posting through the submission form on the workshop website http://kagakushi.org/iwhc2015. General inquiries should be sent through the contact form on the same website. The format of the workshop will not allow for more than about 20 papers. Applicants will be notified if their papers have been accepted or not by July 1, 2014. Presentation papers are due to be submitted by January 31, 2015. Papers should be about 5,000 words (including notes) long. They will be made available only to registered participants in the workshop via a restricted section of the website before the workshop. The registration fee will be 10,000 JPY, conference dinner 10,000 JPY, and excursion optional. It will be possible to obtain limited economic support for travel expenses of paper presenters from abroad. Please indicate in the application if such support is required for attendance and what level of support will be needed. More information will be announced later. Workshop venue: Tokyo Institute of Technology (2-12-1 Ookayama, Meguro-ku, Tokyo 152-8552). The workshop will be two full days, from morning to late afternoon March 3-4, 2015. Late afternoon/evening March 2 is reserved for registration, reception, and possibly one keynote lecture. The workshop language will be English. It is possible to register for participation without giving a paper. The deadline for such registration is January 31, 2015. The workshop is organized by the group of historians of chemistry under “Grants-in-Aid for Scientific Research (KAKENHI)” Grant Number 24300295 to study the transformation of Japanese Chemistry in the 20th century. It is supported by the Japanese Society for the History of Chemistry (JSHC), the Commission on the History of Modern Chemistry (CHMC), the Society for the History of Alchemy and Chemistry (SHAC), the History of Science Society of Japan and the Chemical Society of Japan. The workshop will be held to commemorate the 40th anniversary of the foundation of JSHC.